You may have heard of the Trust Economy. In the past 10 years or so it’s exploded in popularity and renown. Essentially, the Trust Economy is the theory that reputation, trust, and an inherent belief in the goodness of people are creating a new economy, one that can be (like US Dollars) be exchanged for goods and services. Between the summer of 2012 and the summer of 2014, AirBnB stays in the city of Paris skyrocketed, from 97,799 guests to 517,821. Some economists are estimating that global revenue from Trust Economy businesses (and the growing sector) will rise to $335 billion dollars in the next ten years. The way we trust (and our likelihood to do so is changing). So how can you take advantage of the Trust Economy? How can you develop trust with prospective consumers? I think it’s safe to say we’ve covered the first three principles of social influence, so let’s dive into those last three, and how they effect Trust between business and customer. It’s not a huge surprise that people prefer to say yes to people they know and like. A request coming from your best friend for a $100 loan is far more appealing than one from a complete stranger. The difficulty arises when we’re talking about a business and a consumer. All those adjective can be just as easily applied to a business (“sincere” in your advertising campaigns, “transparent” in your mistakes and business practices, and “understanding” in your ability to empathize with your prospective customers) as an individual can. Leads and customers like to know they’re being listened to. If your brand is focused only on what you’re doing, your customers will notice. Ask what your customers are concerned about, what their biggest frustration is. Ask them for advice on what you should do next, or why. Get them involved in your success, and they’ll have a vested interest in it. If someone feels like they’ve noticed or engaged with your brand of their own accord, they’re far more likely to have a positive opinion of you. 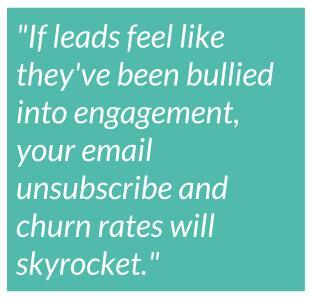 If they feel like they’ve been bullied into engagement, your email unsubscribe and churn rates will skyrocket. Instead, win people over with sincerity and confidence (but not overconfidence). When given attention (particularly in high-profile instances of PR or write-ups) shift focus to your colleagues, employees, etc. If someone recommends you to a friend, you need to be exactly what they said you were. If you change an element of your service, make it clear, make it obvious, and tell everybody. Surprises (like change) aren’t good for developing a reliable relationship with your customers. Consider a “grandfather’ed” pricing structure, so anybody who’s currently subscribed won’t end up paying more for the same product in the future. Create a reputation of a brand which communicates with its customers in a personable, genuine way. Don’t send templated questionnaires, but ask simple questions without an email layout. 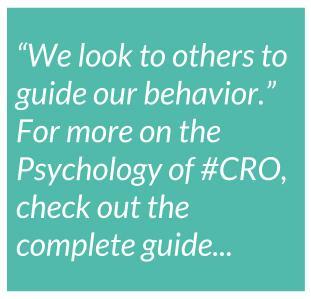 This is particularly important in any social media strategy. Be personable. Ensure your emails are signed off with a first name (test a last name as well). Show your face and put time and energy into your “About Us” page. We look to others to guide our behavior. After all, it’s easier than the alternative. Relying only on ourselves and distrusting the entire world around you would be a very scary way to move through it. But this faith in others can have an extremely interesting effect on the way we feel about the people, places, and businesses around us. 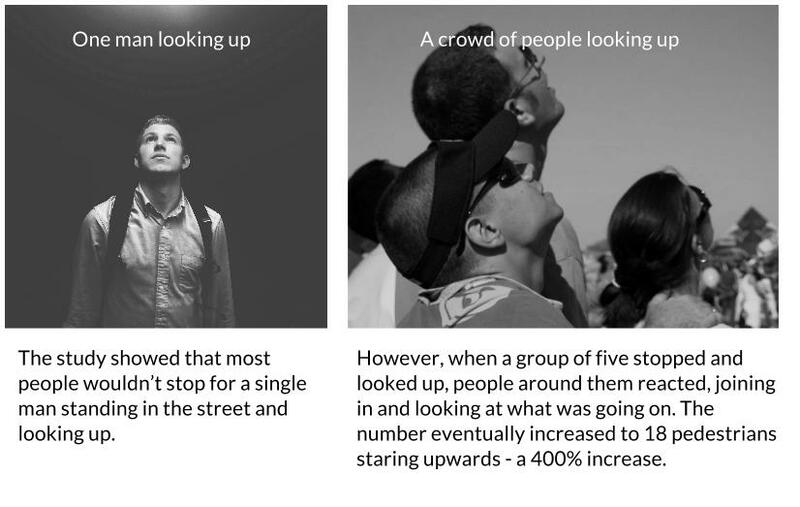 You may have heard of the “Man looking skyward” experiment. In 1969, a study in the Journal of Personality and Social Psychology was performed on the streets of New York City. A single man stopped on the street and stood, looking straight up in the air as if there was something there. The study’s objective was to determine if social proof plays a role in the reactions of pedestrians. If prospective customers know that people like them have engage with or trust your business, they’re significantly more likely to do so themselves. They feature real and relatable people, increasing the personality of your page. They feature people similar to your site traffic, increasing the chance of that traffic trusting the rest of your message. They can be specific, offering almost case-study-like metrics, KPI’s and analytics in real-world and concrete terms. Another way for you to create social proof is to be backed up by someone your prospective customer recognizes. This is done, primarily, through trust symbols. A couple years ago, Express Watches (an online retailer for Seiko-brand watches) was looking to address their consumer’s anxiety regarding the nature of their product. As watches are notoriously susceptible to being imitated, Express Watches wanted to run a test to eliminate their consumer’s anxiety. They replaced an image on the right-hand side of their product page (which initially read “Never Beaten on Price”) with a blue and black trust symbol from Seiko itself (reading “Seiko Authorized Dealer Site”). The result was dramatic: a 107% for conversion rate jump over the 30-day test, from 1.81% to 3.76% overall. Feature the full name of your customer within your testimonial (as well as job title and business name if you’re B2B or SaaS): This increases the chance of your page traffic relating to the customer on a personal level. Feature the face of your customer: This has a huge effect on whether or not your testimonial is trustworthy and real. If your business isn’t quite a household name, consider using a larger brand’s name to create trust (either a trust symbol from a sector authority) or recognizable logos from the companies you’ve worked with in the past. What makes someone worth listening to, beyond the fact that they’re likeable or that people you trust are? How about when they know what they’re talking about? Communicating your brand expertise through content marketing (and email marketing) is crucial to relationship-building between you and your prospective, or existing, customers. Delivering high-quality, educational content isn’t just about keeping your brand top-of-mind for leads and customers, but also about developing trust and creating a reputation for know-how. A great example of content driving authority is in the banking sector. In August of 2014, NewsCred ran a survey among 1,001 adults, asking them their banking behavior and reasoning. 31% of respondents said they have signed up to new products and services based on useful content from their bank. 58% say personal finance content helps them make decisions. 57% say communication from a bank can help them understand which products are most beneficial. Finally, there are a few content mistakes that financial services (though of course the lessons are relevant to all sectors) sector is making that cause consumers to turn against content: being too sales-oriented (19%), boring (18%), long (12%), or hard to understand (11%). 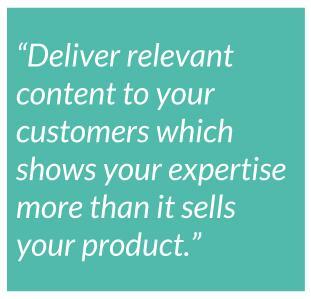 Deliver relevant content to your leads and customers which shows your expertise more than it does your need for them to buy your product. Content should be roughly 80% educational content and 20% sales-oriented within any lead-nurturing campaign. Content should be delivered on a regular basis. While each audience and sector expects different amounts of content, the important thing is to deliver it regularly. If you have the resources, put time and energy into creating case studies and industry reports, as these are the most valuable types of content when it comes to building authority within your sector. Nothing makes you more trustworthy than a proven, original statistic.